How are those tough New Year’s resolutions going? The start of the year is always a popular time to take a look back at the last twelve months and ask ourselves what we could do better. But it can be harder to make these good intentions stick. And our professional lives are no different. Creating sustainable, lasting improvements to the way we work is a much bigger challenge than a one-off win. 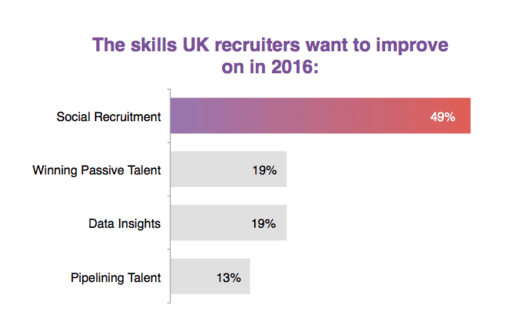 Towards the end of 2015, over on our Twitter channel (@HireOnLinkedIn), we asked UK recruiters to share with us the skills they want to master in 2016 with our #RecruitingSkills campaign. The response was incredibly positive – it’s great to know recruiters care about their own skills as much as they care about finding the ones their business needs. We all have to adapt to a changing world, and the hiring process is no different. The big question is what did they tell us – and, more importantly, what can they do about it? Half in our online poll have said they are grappling with social recruitment – despite the fact that this is the number one source of quality hires (according to LinkedIn research). It’s no surprise to see this top of the list when it comes to recruiters’ self-improvement. Why? In a short space of time, both in-house and agency recruiters have gone from relying on job boards, little black books and cold calling candidates, to finding and engaging the best candidates for the job online. There is now a wealth of useful data at their fingertips to help – but only if they can find it and apply it in the right way. Furthermore, recruiters are now successfully hiring candidates who were not actively looking for a new job in the first place. These potential hires need to be engaged very differently compared to people proactively looking for their next position. Long gone are the days of posting a job advert and sitting back to wait for CVs to simply flood in! And for candidates, social media and the web mean they have access to more information about potential employers than ever before. They may know more about day-to-day life in a business than some of its senior leaders; they certainly have more career options available to them as a result. No wonder then that social is transforming recruitment. So what can recruiters do to really tackle this? There is plenty of killer advice available from our in-house experts – and others in the field – to help overcome all these problems. To find out what skills you need to be the world’s greatest social recruiter today, how the role is evolving and what getting your employer brand online is all about – check out The Savvy Recruiter’s Career Guide. If engaging and winning over passive talent is top of your list – and as two-thirds of talent in the UK is passive, why wouldn’t it be? – then check out this guide to engaging with these potential candidates. Recruiters who use data insights in the recruitment process hire faster and hire better. Data is the secret weapon every recruiter should be able to deploy. Find out more in our infographic showing why data makes for better recruiters. And finally, if it’s pipelining talent that you want to tackle, we have 12 tips to build a stunning pipeline available to help you build a warm community of candidates for your hardest-to-fill roles. 2016 is already shaping up to be a great year – but one thing is certain; no recruiter can afford to stand still and keep using out of date tactics. Only those who keep on adapting and evolving will survive. I’d love to know what your big challenges are this year and what sustainable changes you are striving to achieve in your work – please do share them in the comments below. In the meantime, good luck and very best wishes for the year ahead. Chris Brown, Director of UK Talent Solutions at LinkedIn.